Will Hand Chord enable anyone to play guitar? A helping hand for those struggling to learn the guitar? For as long as people have been playing guitar chords, they've had to do two things: form the chord on the fretboard with one hand, and strum the strings with the other. 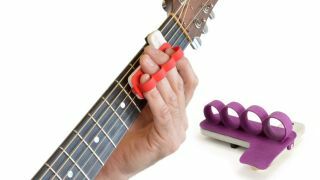 However, with Hand Chord, a new product that's currently the subject of a Kickstarter campaign, the promise is that you only have to do one. Hand Chord's creators say that: "The number one reason people give up playing guitar is because of finger pain. Hand Chord takes away the pain and frustration; no more hurting fingers, just a soft cushy rubber feel. "It's also a shortcut for people who don't have the time to learn guitar and can also be a gateway for people learning guitar to help them concentrate on strumming and getting a feel for playing guitar without months of practice." Of course, some might argue that calluses and blisters are all a part of the guitar learning experience. With Hand Chord, though - which can be set up to 'finger' many different chords - the theory is that you just line the thing up on the strings, squeeze it on the neck and strum. Then, lift off slightly, slide to the next chord and strum again. With the appropriate attachment, Hand Chord is also said to be suitable for playing slide guitar. You can find out more on the Hand Chord Kickstarter page, where a $35 pledge will secure you one of the things if the project is funded (other pledge options are also available). Or, you could just learn to play your barre chords the old fashioned way.